Towards the end of February 2018, BigLift Shipping’s BigLift Baffin arrived in Singapore to deliver a crane boom and luffing frame for Heerema Marine Contractor’s new flag ship Sleipnir from the Huisman wharf in Xiamen, China. This is the first project for the vessel after her transformation into the BigLift colours. Sister vessel BigLift Barentsz’ first voyage in the BigLift livery will start next month with a shipment of container cranes for a Japanese client. It is well-known that at the end of 2017 BigLift Shipping ended the co-operation with RollDock for the management of the MC-Class vessels. Since 1 January, the two BigLift-owned MC Class vessels have been part of the BigLift fleet and are now sailing under the names BigLift Barentsz and BigLift Baffin. By adding the two wide deck carriers to the BigLift fleet, BigLift’s heavy transport capabilities have grown significantly, when looking at module size handling, load carrying ability, shipping optimization and project efficiency. Subsequent to the fleet expansion, BigLift is engaged to further focus on developments in the Renewable and LNG markets. This involves transport of jackets and the new-generation monopiles but also of large modules for substantial LNG projects. BigLift is also looking towards opportunities in a rebalancing Oil & Gas segment and at global expanding ports and new port developments. All these market developments and subsequent projects demand good insight and analysis for optimized project execution. The BigLift organization is more than capable and prepared to perform the necessary tasks. Complementary to the BigLift engineering department a significant part of the BigRoll engineering team has moved to the BigLift office in Amsterdam after the winding up of the BigRoll enterprise. BigLift’s decision to end the BigRoll venture shows BigLift’s confidence in its capabilities and market approach. It further underlines BigLift’s dedication to providing customers with reliable and efficient heavy transportation solutions. By understanding the customer’s specific needs and by thinking in solutions, a better project result will be secured, reducing risk and costs. 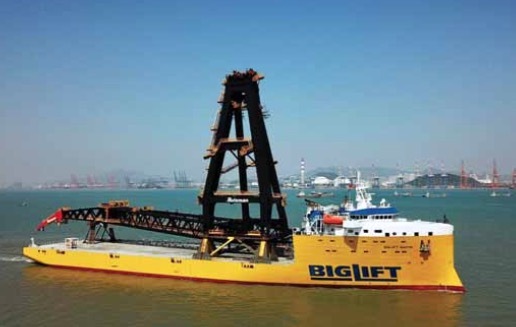 BigLift Shipping — a member of Spliethoff Group — is a world-renowned heavy lift shipping company with a history dating back to 1973. BigLift’s fleet consists of 14 modern heavy lift vessels with lifting capacities up to 1,800 metric tonnes, and two state-of-the-art heavy transport vessels with their large 125 × 42 metre deck, the MC-Class vessels increase BigLift’s shipping capabilities for Ro-Ro cargoes up to about 16,000 metric tonnes a piece.